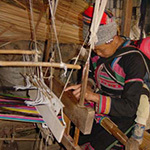 Click the button below to add the Christmas tree card (red) handmade in Laos to your wish list. This cute Christmas card was handmade by the women of Savannakhet Province of Laos under Fair Trade conditions. Jute fiber is 100% bio-degradable and recyclable and thus environmentally friendly. It is blank inside, and it will be perfect for carrying your loving messages to your loved ones. Your purchase helps these people to have hope for a better future.